The PIXMA TR series is a replacement of the out-of-date MG series from Canon. Some experts may even claim the PIXMA TR series to be better than the much-lauded Maxify series from the same Original Equipment Manufacturer (OEM). The TR series consists of two models – the Canon PIXMA Home Office TR8560 and the lower end TR7560. We’re, of course, going to be reviewing the TR8560 here. The Canon PIXMA Home Office TR8560 is a consumer grade device. 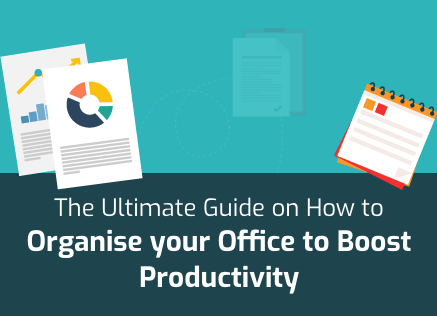 This means that it is meant for individual users or Small Office/Home Office (SOHO) setups. 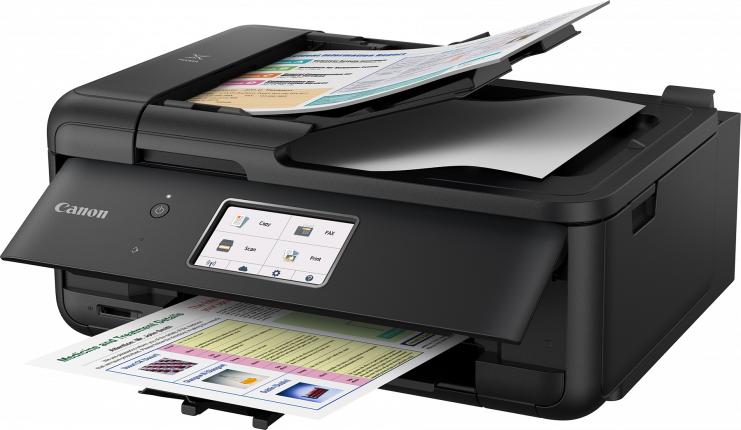 The TR series is a series of inkjet All-In-One (AIO) devices which means that the TR8560 can print, copy, scan, and fax. Here’s our review. 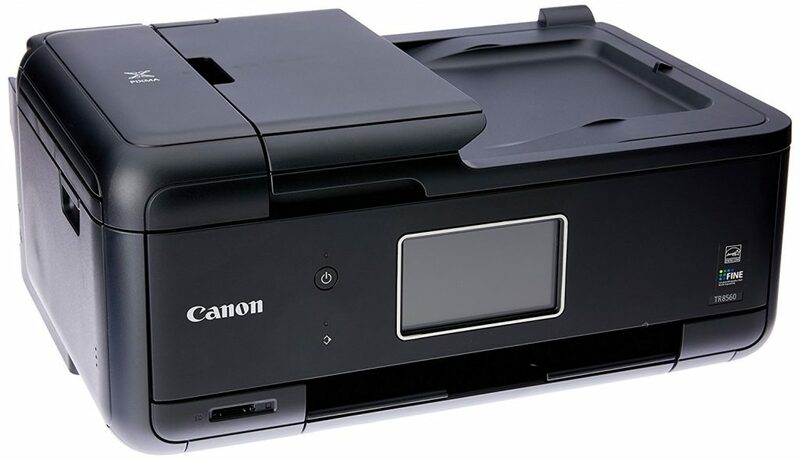 The print quality of the Canon PIXMA Home Office TR8560 is its primary selling point, but then that is true for all Canon devices. If you’re going to buy Canon, then it’s obvious that your priority is output quality. In fact, it is also fairly obvious that you want to print some photos on a regular basis. Being one of the recent entrants into the Canon catalogue, it isn’t surprising that the output quality of this device is nothing short of smashing. Its text output is clear and crisp even at lower font sizes. In fact, you’ll see extremely well-formed characters even at sizes that force you to dive into the paper. Graphics also come out well on the Canon PIXMA Home Office TR8560. The printer particularly delivers good gradients with minimal banding. Photo printing shouldn’t be a problem either with vibrant and accurate colours a highlight. The printer can print at a maximum resolution of 4800 x 1200 dots per inch (dpi). The printing technology inside the device makes use of Canon’s Full-Photolithography Inkjet Nozzle Engineering (FINE) system which allows for precision control of microscopic ink droplets. Furthermore, the device makes use of two black cartridges – one pigment and one dye. This makes it more versatile in terms of black gradients. Another highlight of the Canon PIXMA TR8560 is its size. It is smaller than the MG series it replaces and even the Maxify series that it claims to supersede in terms of quality. How small is it? Let’s just say that if space is a premium element in your office, this is the printer you’ll be most inclined towards. The device measures about 190mm high, 351mm deep, and 438mm wide. It doesn’t even weigh that much, coming in at only 8 Kg. The device also boasts of a 20-sheet Automatic Document Feeder that supports automatic duplex printing. Considering the market segment the Canon PIXMA Home Office TR8560 is manufactured for, it is slightly on the expensive side. This, however, is true for virtually every Canon printer. Its justified in a way because very few printers can compete with the output quality of Canon models. This particular device’s listed price is above $200 but it is possible to get discounts worth around $40 to $50 on that. You just need to shop around. 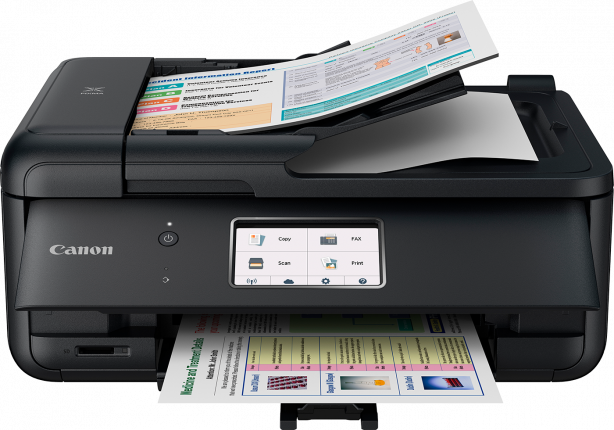 Running costs will be more of a challenge than the acquisition cost, despite the fact that the Canon PIXMA Home Office TR8560 accepts XXL size cartridges. While using XXL cartridges will help your per-page costs, you should consider compatible or generic cartridges because Canon printers are generally known to be expensive to run. Buying from the aftermarket can bring down operational costs. Paper capacity can be seen as a limitation as well. The most sheets you can load this printer with are only 100. It is a low volume printer, after all. If you want more paper capacity, you need to look elsewhere. The Canon PIXMA Home Office TR8560 is intended for home use or micro office use. These kinds of setups generally don’t have elaborate Ethernet networks. This is possibly why the OEM gave the Ethernet port a pass with this device. At the same time, you do get to connect to the device through Bluetooth. Bluetooth connectivity isn’t very common and comes in very handy when it comes to printing your photos. Apart from Bluetooth, you can connect to this device wirelessly or with a USB cable. 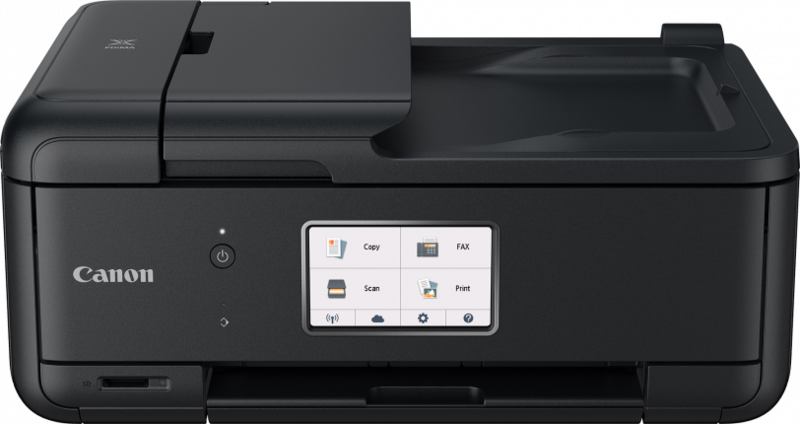 The PIXMA TR8560 supports Google Cloud Print and Apple Air Print in addition to offering up the PIXMA cloud link functionality. You can do this via the Canon PRINT app to gain compatibility with third-party services such as Facebook, Instagram, Google Drive, Dropbox, and One Drive amongst others. If you’re used to enterprise-class printers, then this device’s print speed will disappoint you greatly. 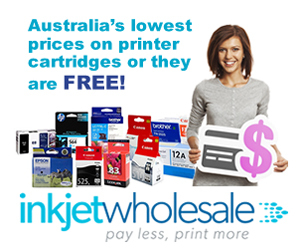 Inkjet printers are usually slower than laser printers. Similarly, printers in this price bracket tend to be slower than more advanced business printers. The Canon PIXMA Home Office TR8560 prints monochrome documents at a speed of 15 images per minute (ipm) and colour documents at 10ipm. Be prepared for these speeds before you sign off on this machine. The control panel of the Canon PIXMA Home Office TR8560 consists of one display screen and one button. The LCD colour touchscreen measures around 110mm and has a fairly intuitive user interface. It can be used to access most functions of the device. It is so accomplished, in fact, that it is only accompanied by the one “Power” button. The front panel opens up to deliver the printed sheet. Just underneath the front panel is an SD card slot. The SD card slot should appeal to amateur photographers as they can print their photos directly from their SD cards. While the TR8560 offers automatic duplex printing, the same cannot be said for duplex scanning. This means that if you want both sides of a sheet to be scanned, you’ll have to do it manually. The scan quality is good with the device capable of scanning up to a resolution of 1200 x 2400 dpi. The Canon PIXMA Home Office TR8560 comes with a 12-month Return to Base warranty.